This was the first time PINKS has ever come to Englishtown, and it was sold out early and brought in the record breaking attendance to this legendary track. Talladega is without a doubt one of the biggest and craziest tracks in all of NASCAR. Conditions were perfect for our show. The Hell On Wheels boys looked unstoppable - and then disaster struck...! Presented by RacingJUNK.com, Hell On Wheels returns to the Monster Mile once again. We’ve been here so many times and have been very fortunate to have some great shows, but it’s getting harder and harder to up the ante! Will the boys be up to the challenge? over the last 30 years - from kids doing tricks on bikes, to earning a place on world sports' most prestigious stage. We seem to have a great time whenever we go to Dover. What else can you say, it has a full-blown Las Vegas style casino right on the track. The Monster Mile rocks! The new 47-foot statue of “Miles the Monster” is awesome! With the perfect weather and the sold-out crowd, the stage was set for another great show. HELL ON WHEELS performed at the biggest race of the NASCAR Sprint Cup Series, Daytona 500, and it’s their 50th anniversary celebration, bringing in over 250,000 people! "It's perhaps the most impressive bicycle exhibition team in the world." Said Bryan Stealey, Live Nation's FMX Souvenir Yearbook. Read the complete story here. After 38 weeks of racing, it all came down to this - Ford 400 at Homestead-Miami Speedway. This track was beautiful! High-tech, bright colors, Vegas style lighting, and even had a beach with palm trees in the center of the oval. RaceFest is an end-of-the-season party held in downtown Ft. Lauderdale to promote and celebrate the last big races of the year. NASCAR was there in full-force with cars, drivers, owners, sponsors and celebrities. event in their boats. This was their 23rd annual event. Everyone was there - little kids, old folks, the mega rich, the homeless, Kevin Cosner, even the mayor of St. Pete. HELL ON WHEELS headed to Atlanta Motor Speedway for the NEXTEL Cup Sereis Pep Boys 500. While the crews of drivers like Jimmy Johnson, Jeff Gordon and Tony Stewart got prepared for the race #7 of the 10-race Chase for the NEXTEL Cup, HELL ON WHEELS crew was making their way to the Start/Finish line. Old McDonald had a farm... and on that farm he had... a box jump? That's what happened when Hell On Wheels teamed up with the American Royal livestock and cattle expo. American Royal has been a part of Kansas City Missouri history for a hundred years now, and this year the Royal added BMX to its herds of broncos and bulls. The Chase is on, and HELL ON WHEELS is back to the Monster Mile once again. With the perfect weather and the sold-out crowd, the stage was set for a great show. The team kicked off the show in the infield pumping up the fans, and they then took the oval for 25 minutes. The 20th Annual NOPI NATIONALS Motorsports Supershow is billed as the largest import car show in the world. A crowd of 80,000+ people was recorded along with over 7,000 show cars and trucks. HELL ON WHEELS wowed the attendees with 6 shows over he two-day event, and this year's nearly perfect weather really made it a lot more fun. 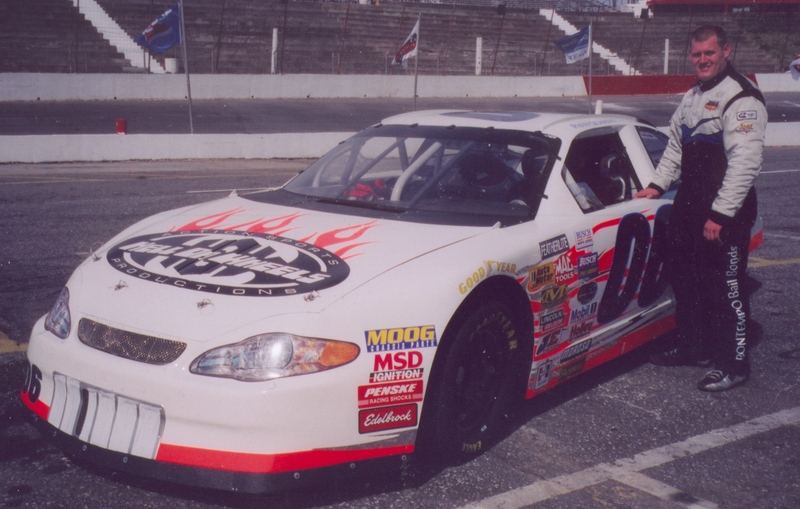 Richmond International Speedway played host to Chevy Rock & Roll 400, the last qualifying race to be in the Chase for the NEXTEL Cup. As the drivers and their crew get ready for the green flag, HELL ON WHEELS took to the track for fifteen minutes of white knuckle action. The gang from Hell On Wheels parked their “one of a kind” ramp right on the 50 yard line to perform one of the most thrilling BMX half time shows ever. 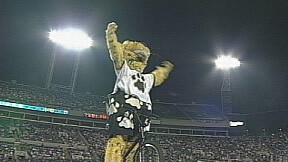 Last season, the Jaguars mighty mascot, Jaxson DeVille, took a run at the Hell On Wheels box jump and ended up one sour puss. Rumor has it that in an attempt to redeem himself, DeVille spent the off season practicing. HELL ON WHEELS returns to the Monster Mile once again. Due to bad weather, all on-track activities were canceled, but the team decided to put on a show in the infield, raining or not. HELL ON WHEELS takes on the Lady in Black, the track “too tough to tame.” After a total rain-out of the Saturday race, the team stayed for an extra day. The Tribeca Film Festival was founded by Jane Rosenthal and Robert De Niro in 2002 to contribute to the long-term recovery of lower Manhattan after the September 11 attacks on the World Trade Center and to celebrate New York City as a major filmmaking center. With over 250 films and 1,000+ screenings in both 2006 and 2007, the Tribeca Film Festival has become one of the most prominent film festivals in the world. the action really heats up! It's a Super Bowl scene like you've never seen before!" country. Once again,big props to the riders and crew for a great job, and special thanks to the race fans, the track staffs, sponsors and the SPEED Channel for their support. HELL ON WHEELS made its debut to the NHRA POWERade Series at Englishtown New Jersey, K & N Filters Top Fuel Summer Nationals on June 15-18. The sold-out crowd and the fellow riders were stunned when Scotty Cranmer hit a monster frontflip, possibly the biggest one ever! The crowd went crazy when he landed it! 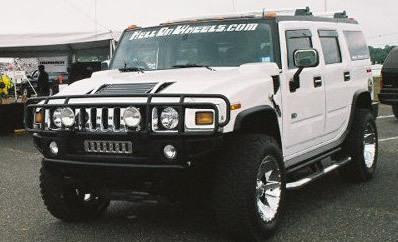 Be sure to look for HELL ON WHEELS at other POWERade events in 2007. Mascot de Ville Goes Down! Bike Warriors, headed by film maker Drew Stone. The riders all met at a military base in Jacksonville , Fla.
Scotty Cranmer had an amazing season - He won the gold at the X Games, and at the Dew Tour, despite the horrific crash in a double backflip attempt at the last stop, he came in 2nd overall by winning 2 of the 5 stops. We will have a sit down with him as he looks back on 2006. HELL ON WHEELS Invades NASCAR! ERS Motorsports and Hell On Wheels Productions today launched an unprecedented promotional campaign that combines the speed of stock car racing with the thrills of extreme sports. Today, fans were given their first look at Ryan Seaman's 06 Monte Carlo emblazoned with the Hell On Wheels logo and website address. A chiropractor and an athletic trainer, Dr Pete Lowenstein comes on board to help keep the riders healthy and going strong throughout the 2006 show season. Cranmer Takes X Games Gold! BMX Freestyle Park. A.K.A. "Bulldozer", the 19-year-old improved upon his silver medal performance at last year's event. World's top riders will return to Toms River Fest '06 in full-force. Check out the video and recap from the previous year. A series of five major, multi-sport Tour events that boasted the biggest competitive purse in action sports last year is back again in 2006. Dew Actions Sports Tour got underway on June 22 in Louisville, KY and Scotty Cranmer leads off the tour series with a home run in BMX Park. The Huffy Bicycle Company's successful line of kids' chopper bikes, inspired and designed by West Coast Choppers innovator Jesse James, was introduced on June 24-26 at Disney Adventures magazine's Future of Cool "Hell On Wheels" event. BMX / FMX / Street Bikes / Globe of Death / Trials all mixed together to create a mind-blowing, one of a kind show. 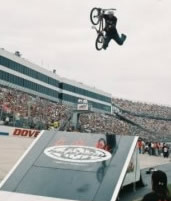 A series of five major, multi-sport Tour events, the 2005 Dew Action Sports Tour boasts the biggest competitive purse in action sports, a Million-Dollar Bonus Pool based upon year-end standings, and the largest network and cable television broadcasting commitment ever. The Tour's 2005 season will kick off on Friday, January 14, when FUEL's sister company, Fox Broadcasting Co. (FOX), will film a one-hour Tony Hawk's Underground 2 presents Boom Boom HuckJam special at Glendale Arena near Phoenix, AZ. BMX - Scotty Cranmer, the wonder child out of Jackson, NJ, now has a few new tricks up his sleeves. One is believe it or not, the Double Tailwhip Backflip . He has made it more than once. And another is the Turndown Frontflip. This year, their 10-race schedule will be highlighted by the inclusion at two NHRA POWERade Drag Racing Series events. 2005 marks HELL ON WHEELS' 5th year return to the series. NDRA/NOPI Show Series 12-city tour plus the "Big Daddy" of the import shows, the NOPI Nationals in Atlanta. We'll be performing at select cities throughout the tour. Founded by Actor Paul Newman and Kyle and Pattie Petty to help enrich the lives of children with chronic or life-threatening illnesses. Our stunt show will be stopping by the camp to entertain the kids and their families. A cool event for a good cause! PLUGG JEANS CO. and HELL ON WHEELS are teaming up for the UNLEASHED Tour '05, a multi-city tour of malls around the country. The shows will give people a chance to meet and watch first hand some of the Action Sports Industry's top pros!